DCR22 – Proven. Reliable. High Performing. The DCR22 has established itself as a reliable, productive resource for drilling operations around the world. These drills have been provened in soft, medium and hard rock conditions with multiple end-users and applications providing deep holes from 3.5″ to 6.5″ at fast drilling rates with low maintenance. Servicing the DCR22 is easy with access to all key components such as the engine, fluid levels and compressor through large panel doors located at ground level for maintenance when needed. The cabs have been redesigned to provide operators maximum comfort with single-lever drilling controls, digital gauges, and superior views of drilling operation. Single-lever drilling control for easy operation. Finger-touch levers for smooth traming control. Large windows maximize operator visibility. All-in-One display allows operator to monitor machine functions and angle indicator for quick and easy drilling alignment while remaining focused on the drilling. Walk-around ground level maintenance provides fast, easy upkeep or repair. Rubber-mounted engine frame isolates cab from engine vibrations. Bluetooth Player/Sirius XM Radio is standard. Angle indicator for quick and easy drilling alignment. Drill hole diameter 3.5″ – 6.5″. Reliable dust control system increases suction capacity and provides effective pre-cleaner to reduce the escape of drilling dust. 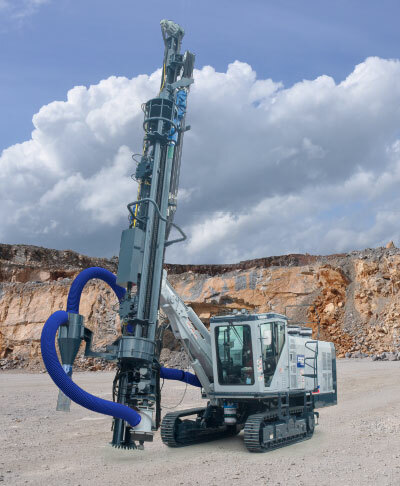 An optional dust suppression system is available for difficult drilling conditions. Advanced rotary pipe changer allows easy drill pipe changes. High-output compressor increases flushing air, provides faster drilling and decreases bit wear. CAT is a registered trademark of Caterpillar, Inc.
AIRMAN is a registered trademark of HOKUETSU INDUSTRIES CO., LTD.
Furukawa’s policy is one of continual improvement. Specifications may change between printing.